The Dewan-e-Khafs or Audience Hall for the Nobility was constructed by the Emperor Shah Juhan, by whom the Royal Palace was also built. It is situated at the upper end of a spacious Square, elevated upon a Terrace of white Marble about four Feet in height. The Dewan-e-Khafs in former times was adorned with Excessive Magnificence and though plundered by Nadir Shah, the King of Persia during his invasion in 1738/9, and subsequently mutilated by the Barbarous Hordes of Mahrattas during the later end of the past and beginning of the present Century, still retains sufficient Beauty to render it the object of Admiration. The dimensions are said to be 150 feet in length by 40 in breadth. The roof is flat supported by numerous Columns of white Marble, richly ornamented with inlaid flower Work of different coloured Stones, chiefly Cornelian. The Cornices and Borders being decorated with Frieze and Sculptured work. The Cieling [sic] was formerly incrusted with a rich Foliage of Gold and Silver Work throughout its whole Extent. This during the Period of Anarchy was removed and an imitation Ceiling, which still exists, substituted. Ugur Firdoce bur Rooe Zumeen ust. Humeen usto Humeen usto Humeen ust. If there be a Paradise upon Earth. It is this. It is this. It is this. 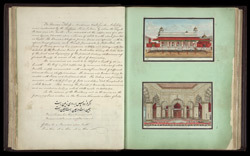 Inscribed: naqsha-i divan-i khass andarun-i qil‘a-i shahjahanabad. Mazhar ‘Ali Khan. Inscribed: naqsha-i andarun-i divan-i khass dar qil‘a-i shahjahanabad taraf-i shamal hast. ‘amal-i Mazhar ‘Ali Khan.